At DocMagic, we think it’s critical for borrowers and lenders to communicate. That's why we’re so excited to introduce BorrowerMobile, an application designed for your borrower's tablet or smart phone! 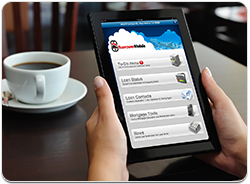 Borrowers can use their mobile devices to easily clear loan conditions, review, share and eSign documents, check loan status in real-time, and schedule important events, like appraisals, directly to their calendar… all with the touch of a finger. Space is limited. Reserve your seat now by clicking this link.